North Korean leader Kim Jong Un signaled his impatience with the United States, saying he was willing to hold a third summit with President Donald Trump, but only if the U.S. comes up with mutually agreeable terms for a deal by the end of this year. "We of course place importance on resolving problems through dialogue and negotiations," Kim told a session of parliament Friday, the Korean Central News Agency reported on Saturday. "But U.S.-style dialogue of unilaterally pushing its demands doesn't fit us, and we have no interest in it," he added. "Anyway, we will wait for a bold decision from the U.S. with patience till the end of this year," Kim continued, "but I think it will definitely be difficult to get such a good opportunity as the previous summit." That summit, in Vietnam in February, ended without an agreement. Kim has repeatedly pledged to give up his nuclear weapons, but insists that it must be done one step at a time, with sanctions relief in exchange for each step. He has rejected the U.S. position that he must denuclearize all at once, before sanctions are lifted. 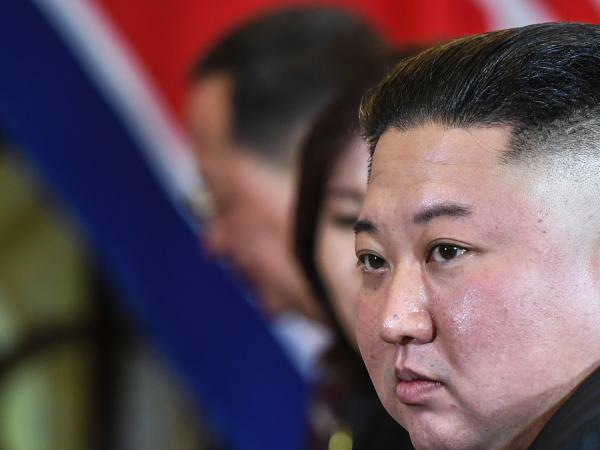 Pyongyang has also indicated that if the U.S. is unwilling to compromise, it could give up on negotiations, abandon a self-imposed moratorium and go back to testing nuclear bombs and missiles. Kim made his remarks at a session in Pyongyang of a newly elected parliament — the result of voting last month in which all candidates ran unopposed. Kim further cemented his grip on power at the session with a big reshuffle of the country's leadership. His other remarks pointed to economic belt-tightening in an attempt to ride out economic sanctions — and perhaps the Trump administration, too – while hanging on to his country's nuclear arsenal. At the meeting, Kim was re-elected as Chairman of the State Affairs Commission. That means he retains, as expected, his posts as leader of the ruling party, state and military. Long-serving officials such as 91-year-old Kim Yong Nam, the titular head of state, and Premier Pak Pong Ju, 80, were either retired or promoted to symbolic posts and replaced by younger officials. On Wednesday, Kim he told ruling Workers' Party officials to make the country's economy self-sufficient, "so as to deal a telling blow to the hostile forces who go with bloodshot eyes, miscalculating that sanctions can bring (North Korea) to its knees," the official Korean Central News Agency reported.